how do they do at speed? obviously my motorised bike will go a bit quicker than your pedal only one but do they show any signs of stress if your really moving like down a hill or something? Sounds like quite a load. Was the fish thiiiiiiiiiis big? Yeah, those are just $5 wheels from harbor freight. Rated for 350lbs. or something. They wobble a bit and aren't completely smooth going down the road but I think the beads are just seated wrong. No other problems really. 1x1 would be my first choice if i had a welder and some more space. You could even do a simple swing arm rear suspension system! I have & use trailers also. Most are converted yard sale kids trailers (1 Burley, a Rhode Gear, and a decent quality generic. All have aluminum tube frames & aluminum rims. 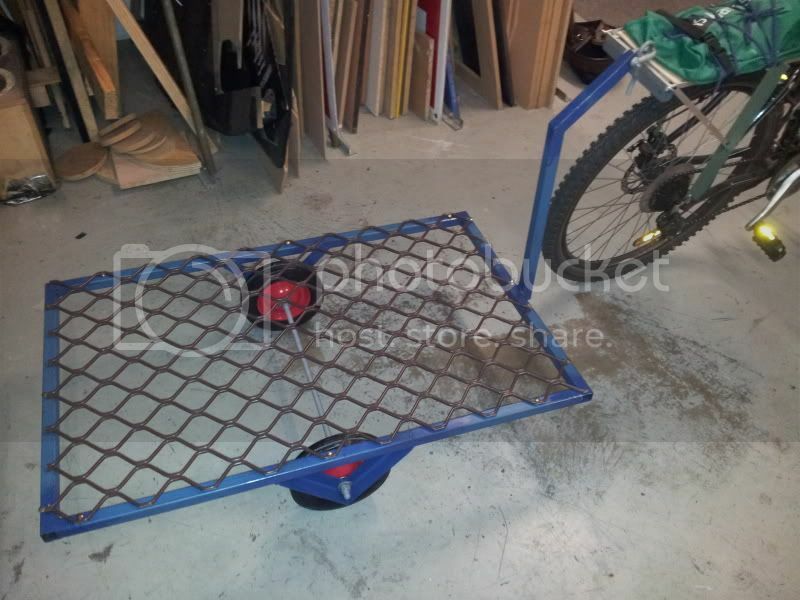 Cheap too - the Burley was $25, but needed rubber. 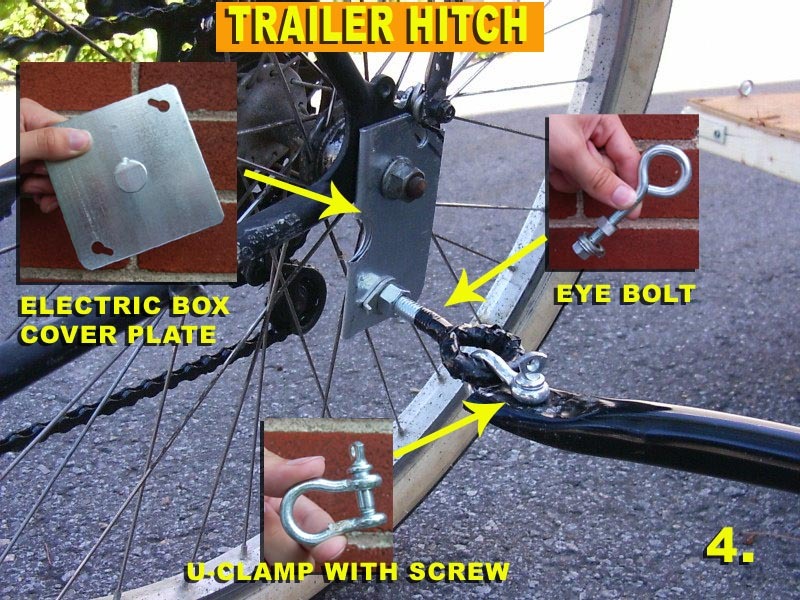 I usually modify the hitch (I ride recumbents) and use air couplings for the hitch - Bikefriday.com sells a similar hitch setup. It's wickedly fast to connect & disconnect, and you can buy the couplers cheap & Harbor Freight. Air quick connectors are quick but not as strong as a solid connector such as a yoke and pin arrangement. If you are using air hose connectors, fill the male end with epoxy steel. The unit is much stronger in shear (right angle to the load) than relying on the unit holding together in tension. A safety strap or chain is a good addition. Just how much shear load do you speculate is on the coupler? More specifically, how much shear is created pulling a 2 wheeled, 20 lb. trailer w/100 lb. payload? I'd wager far less than 15-20 lbs shear load. I would further estimate double that (40-50 lbs.) shear if the trailer catches a pot hole. If it works, it works. Some of the trailers look like there are going to be some hefty loads. Just remember the material including the spring can wear over time and the load is supported solely by the balls in the groove. I am used to working around trailers for construction equipment as well as my two bike trailers. I tell my boys, "Careful, it's only made of metal." As much as I dislike the typical hitching off one of the bike's rear stays (usually the LH side), it's about the only acceptable method. 1. Hitch off the bike's LH chain stay - if enough threads are exposed, you can mount to the rear axle. 2. remove your trailer's tongue at the bed, then reattach (weld?) it to the LH side of the bed with the arc pointing inward. Length looks about right. Now build your hitch. Here's a couple of valuable links with many examples of DIY trailers..
Last edited by Kenny; 06-29-2013 at 12:50 AM.. Similar to Surly Bikes hitches, except they retain the LH side hitch only. But the Surly method still mounts off the bike's rear axle, so you'd need to replace the QR with a longer one, or replace the rear axle with a solid axle. Disregarding the hitch location for a moment, please consider lengthening your trailer's tongue, whatever hitch location you employ. The longer the tongue, the less it negatively effects the bike's handling. Too long and it becomes awkward to navigate tight corners and complicates parking choices. About 18-25" (475-635mm) measured from the leading edge of the bed to the hitch. Also figure on 8-10% tongue weight. (example - if your gross (loaded) trailer weight is, say, 120 lbs, then shoot for approx. 10-12 lbs tongue weight (at the hitch). Last edited by Kenny; 07-01-2013 at 12:16 PM..